Attempting to connect this update to the last, the clutch re-corking process completed, local mechanics hand mixed the fluid needed for the oil bath clutch. Other than a few minor adjustments, the final results were without compromise. Now before you go scratching your head, oil bath clutches are not odd. Almost every motorcycle and ATV has a wet clutch system. In the set up on the Hudson, when the pedal is released, the pressure plate squeezes the oil out of the cork as pressure is applied. The resulting grip is rather stout. "The Hudson's clutch plate is a steel disc with round holes drilled in it. To reline the clutch, you stuck corks through the holes like wine bottle corks. Then trimmed them off with a razor blade. Hudson dealers had a jig for this. The clutch housing was sealed and at oil change time you poured a little Hudsonite clutch oil into the housing. 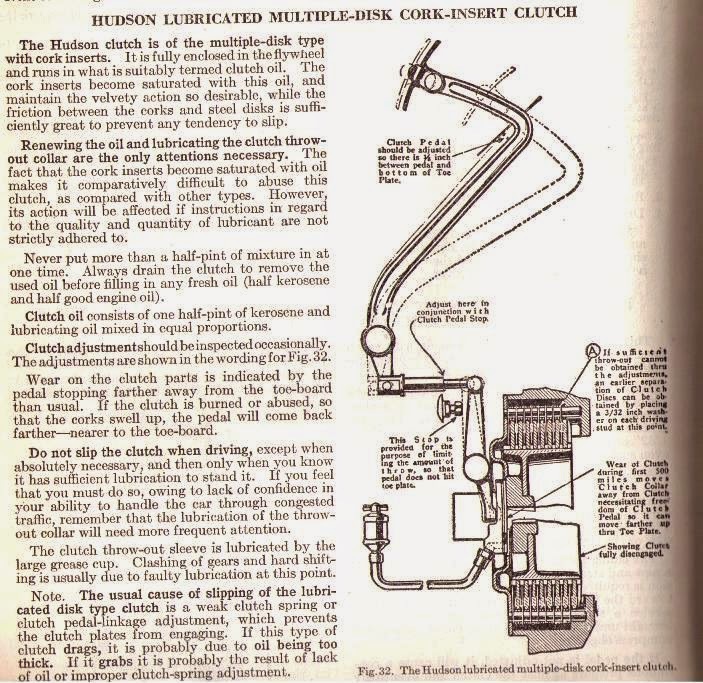 The Hudson clutch was very smooth, long wearing and hard to burn out as long as you kept it full of oil. The clutch is bathed in 1-1/2 cups of "Hudsonite Oil," which is a mixture of 3/4 cup of kerosene and 3/4 cup of motor oil. Some owners use modern Automatic Transmission Fluid Type F. Overfilling the clutch with Hudsonite or ATF will cause the clutch to slip. 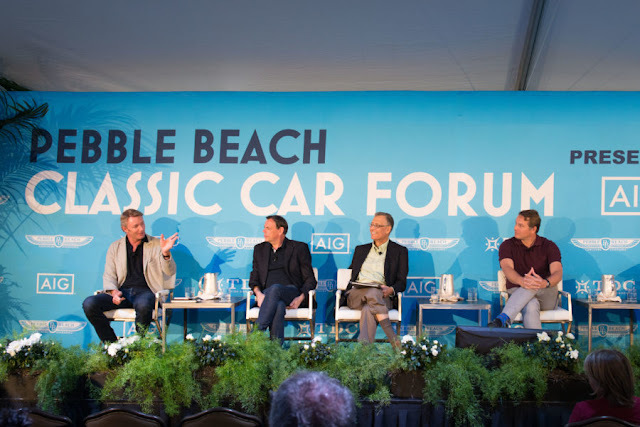 The clutch should be should be renewed (drained and refilled) every 5,000 miles." 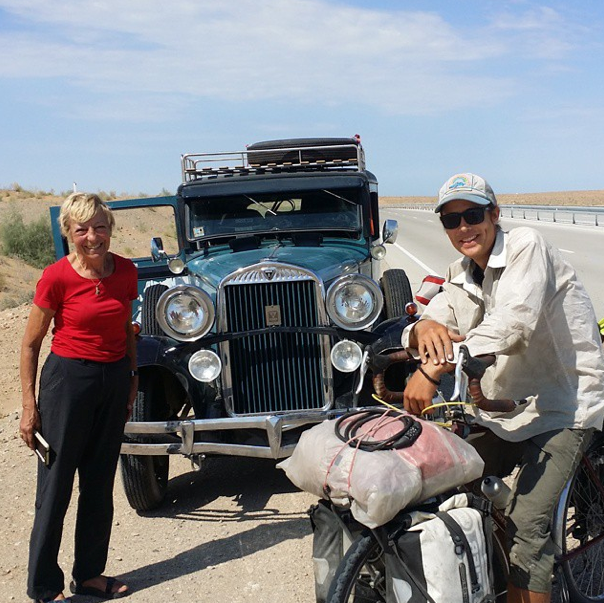 After some sightseeing, Heidi, Patrik and Hudo set out on the 423 mile ride from Urgench to Bukhara, Uzbekistan. Along the way they ran into Julian, a resident of Los Angeles (? ), who is in the midst of his own world tour by bicycle. During the trip they began to hear a knock. There was never a loss of power, but the noise ranged from all but disappearing to frighteningly loud. Unfortunately, with no places along the route capable of service, their only choice was to press onward. 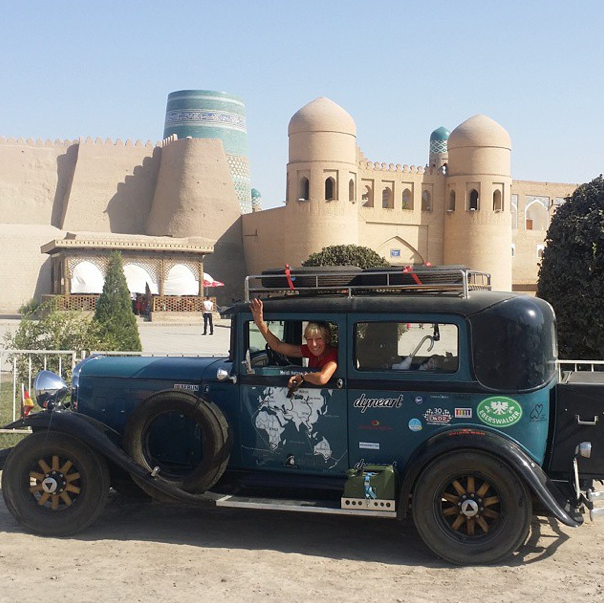 After arriving in Bukhara, they limped the Hudo into a service center. 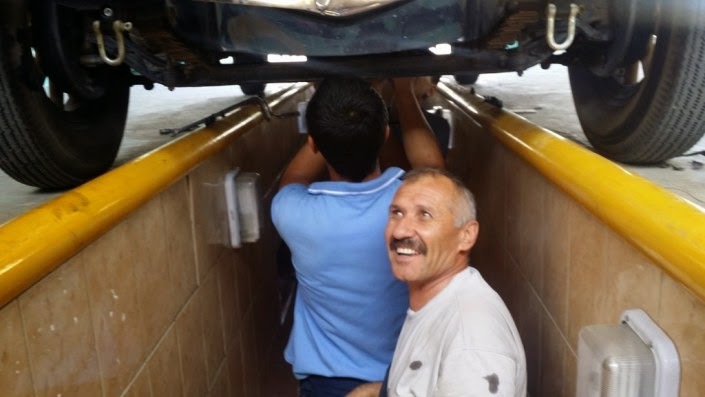 Unable to find anything external which could have caused the noise, the eldest mechanic took the bull by the horns ordering the removal of the oil pan. The pan, full of metal fragments demanded they begin checking the bottom end. One by one, they pulled and inspected the connecting rod bearings on the straight eight. Numbers one through six were fine. Number seven revealed the problem. 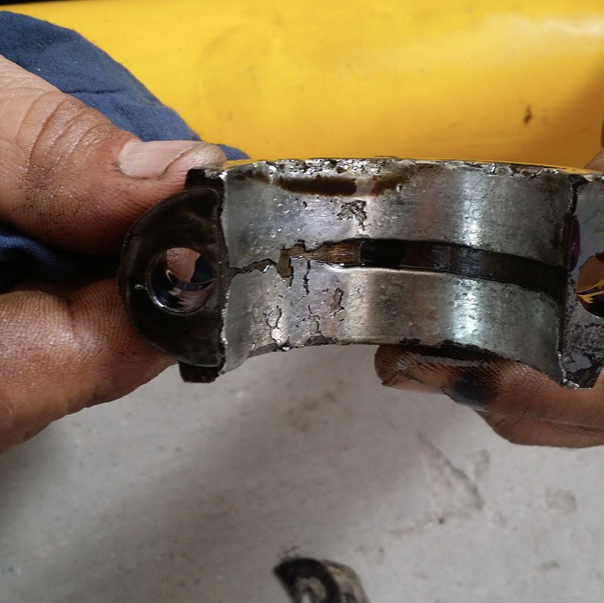 Although Heidi has put out an "alarm" asking for anyone with a connecting rod to contact her team, anyone who has had a similar bearing failure understands this kind of damage almost inevitably means the crankshaft is also damaged. The typical repair requires the engine to be removed and rebuilt. The above photos also seems to show "poured rod bearings", another complication, but we don't have adequate knowledge of the Hudson straight eight. Based on the content of the latest message, it is believed the oil scoop (for the Hudson's splash oiling system) on the side of the connecting rod cap was discussed as the root of the problem. It may be a while before the Hudson sees any more driving. A typical splash oiling "cup". 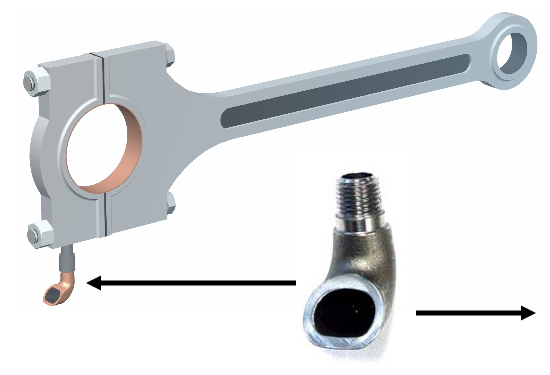 As the rotating connecting rod was "pushed" into the oil reservoir, hydraulic pressure forces oil into the connecting rod bearing, which in turn splashes out oil during rotation. This spray lubricates other internal parts, such as the pistons and camshaft. The main engine bearings also had a "collector cup" which gathered some of the sprayed oil to lubricate the crankshaft bearings.